Trich is short for Tritrichomonas foetus, which is a sexually transmitted disease of cattle. The disease is caused by protozoa and is only transmitted sexually. Trich is an old disease that until recently was thought mainly to occur in western range states, but over the last ~5-10 years has been appearing throughout the Midwest including Missouri. A bull becomes infected by breeding an infected cow. Then, the infected bull breeds another cow; at which time she becomes both pregnant and infected (85% of the cows bred by a Trich positive bull become infected). 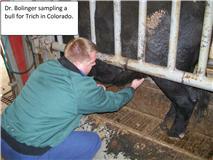 Trich will then cause 30-70% of cows to lose their pregnancies in about 50-100 days. Most of the time, the cow resorbs the fetus and you see no abortion, you only see cows coming back into heat. Occasionally, you will see an abortion or the cow develops a pyometra (pus-filled uterus). If a bull is present when the cow comes back into heat, he will breed her and she can get pregnant again. At this point, the cow usually has enough immunity to fight off the infection and carry the calf through to a live birth. After a live birth, the vast majority of cows have cleared their Trich infection, but they also have lost all of their immunity from the year before. There are a few very rare cows that can have a live calf and still be infected with Trich, but they are probably less than 1% of cows. While cows can clear a Trich infection (i.e. cows that are over 120 days pregnant are considered to not have Trich), once a bull is infected he is infected for life. However, not all bulls become infected and while there are many reasons for this, not all of them are known at this time. Trich is a devastating disease for the cow-calf operation, resulting in 30-70% pregnancy loses in naïve herds and greatly delaying the calving distribution in herds with longer breeding seasons. This is the kind of disease that if not addressed can put producers out of business. Trich is a disease that is best addressed through good management strategies. You should work closely with your veterinarian in developing best management practices for preventing Trich from entering your herd or eliminating it, if you have had the misfortune of having your herd infected.